Batter up! Baseball on the MS Gulf Coast is in full swing! When the weather gets warmer on the MS Gulf Coast, it means the beginning of Shuckers season! The Biloxi Shuckers, a minor league baseball team named in honor of Biloxi’s history as the one-time Seafood Capital of the World started games this week…their stadium is just a 10min. drive from The Roost! Check out some details here along with a link to the 2019 Season Schedule! Head out to the Barrier Islands with Captain Mayfield! Explore the Mississippi Sound and the Gulf of Mexico with Captain Mayfield and Island Trace Charter! Call The Roost to set up an outdoor adventure unique to the Mississippi Gulf Coast that will make memories to last a lifetime! Whether you’re looking for a delicious pastry, gelato, or a gourmet popsicle, Downtown Ocean Springs is filled with sweet treats within walking distance of The Roost! Check out our comprehensive list below for coffee shops, candy shops, and pastry shops downtown. Downtown Ocean Springs is known as one of the Mississippi Gulf Coast’s culinary hotspots! There is something to suit every taste bud downtown and usually some live music to go along with it! Architectural Digest just announced the most beautifully designed bars in each state AND.... The Wilbur Bar at the Roost has been named “The Most Beautifully Designed Bar in Mississippi.” Read more here! Downtown Ocean Springs is known for its live music. Most weeknights and certainly every weekend, you can find bands playing at downtown restaurants and bars such as The Government St. Grocery, The Greenhouse on Porter, Glory Bound Gyro Co., Murky Waters BBQ, Mosaic Restaurant & Bar, The Hideaway, The Office Bar, The Julep Room, Boots & Spurs, and Mississippi Juke Joint. Whether you are a practicing “yogi” or novice yoga practitioner, yoga is the perfect way to relax your body and mind during your stay. Come back from vacation refreshed and ready to take on the world! Ocean Springs offers multiple options to practice yoga…whether it be in a traditional studio environment, at the beach, or even on the water via paddleboard! The Blue Angles headline this free show that includes the world-famous Aeroshell Aerobatic Team, the Army’s Golden Knight parachute team, the F-16 Viper Demo Team, the ACEMAKER Airshows T-33, aerobatic solo performers, warbirds flyovers, U.S. Coast Guard rescue demos, and a host of modern military aircraft. Street vendors and performers will be present up and down the public display areas along Beach Boulevard. This event is FREE, and just a 5 minute drive from The Roost! “All One People” by Christopher Inglis Stebly. Created as a Mississippi bicentennial project, Chris’ original piece has been installed as one solid aluminum sculpture that beautifully tells the story of the past, present & future of the Ocean Springs community. Light refreshments from Eat, Drink, Love, with a brief program & informal reception. 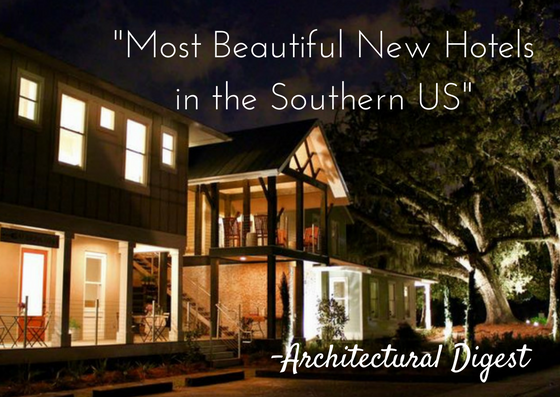 This project was a joint effort of the Historic Ocean Springs Association and the Roost Boutique Hotel, with support from the Mississippi Humanities Council. The public, private, non-profit partnership has been recognized for incorporating original art in property development. Plans are underway to support sharing Stebly’s inspiring art in other forms in the community & beyond. The project team also produced a free color “Art Matters in Ocean Springs” printed guide map, which will be released at the event, and will be available through the Chamber and many other locations in town. The 6 Most Beautiful New Hotels in the Southern U.S... The Roost made the list!!! We are so excited and honored to announce that The Roost was named as one of the most beautiful New Hotel in the South by Architectural Digest! What’s a foodie destination without delicious, write-home worthy, locally brewed beer? The Mississippi Gulf Coast is home to a few breweries worth their weight in suds. Our first choice Brewery is Biloxi Brewing Company offers tours and tastings for $10 for those above 21 years old. No reservations required (unless you want to bring a BIG group). Open Tuesday-Friday 3-8pm and Saturday noon-6pm. Our second location is Chandeleur Brewing Company. Chandeleur Brewing Company brews ales using only malted barley, hops, and local ingredients. Open Monday-Thursday 4pm to 10pm, Friday 1pm to 12am, Saturday 11am to 12am, Sunday 1am to 7pm. Admission charged. Our third location is Crooked Letter Brewing Company. Crooked Letter Brewing Company offers 7,000 square feet of brewing space and includes 2,400 square feet of Tavern space, huge indoor & outdoor bars. Open daily 11am to 11pm. Last but not least, Lazy Magnolia. Lazy Magnolia, Mississippi's first brewery, brews craft beer sold locally and regionally. Tours of the brewery are offered with participants receiving a Lazy Magnolia pint glass and sample of up to 6 different brews. Brewery tours are kid and family friendly. Kids tour for free and get a special Mississippi-mad treat. No samples will be given to anyone under the age of 21. Tours are on Thursday-Friday at 4, 5, and 6pm and Saturday each hour from 11am to 4pm. All guests are required to tour the facility before they can receive their complimentary beer samples. Last call is at 7:15pm and the brewery will close at 7:30pm.